Posttranslational modifications (PTMs) of proteins can be considered an additional step in protein metabolism that greatly expands the proteome of living organisms. In plant systems, PTMs affect protein structure and activity which are associated with concomitant changes in signaling and gene expression that make cellular systems more dynamic. Redox reactions, which are a very old signaling phenomenon in evolutionarily terms, occur in prokaryotes and eukaryotes. The most important redox molecules are reactive oxygen species (ROS), such as singlet oxygen (1O2), hydroxyl radical (·OH), superoxide anion (O2·−), and hydrogen peroxide (H2O2), as well as reactive nitrogen species (RNS) such as nitric oxide (NO) and derived compounds. H2O2 and NO are essential signaling molecules involved in many physiological processes and plant responses to unfavorable conditions. These diverse functions can be partly explained by the fact that ROS and NO rapidly interact to form a number of reactive nitrogen species, such as peroxynitrite (ONOO−), nitrogen dioxide (NO2), dinitrogen trioxide (N2O3), and other NOx species. Moreover, as these molecules share signaling pathways, it is not surprising that cross talk enables pathways to control each other’s functions. 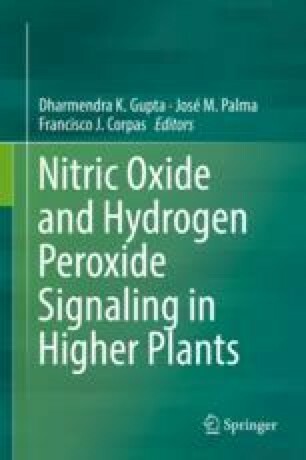 In this chapter, we will explore up-to-date knowledge concerning the effects of H2O2- and NO-derived PTMs such as carbonylation, sulfhydryl oxidations, nitration, S-nitrosylation, and nitroalkylation while emphasizing in the importance of the interplay between their signaling pathways in plant systems. Work in our laboratory are funded by an ERDF-cofinanced grant from the Spanish Ministry of Economy and Competitiveness (project BIO2015-66390-P; MINECO/FEDER) and the Junta de Andalucía (group BIO286).